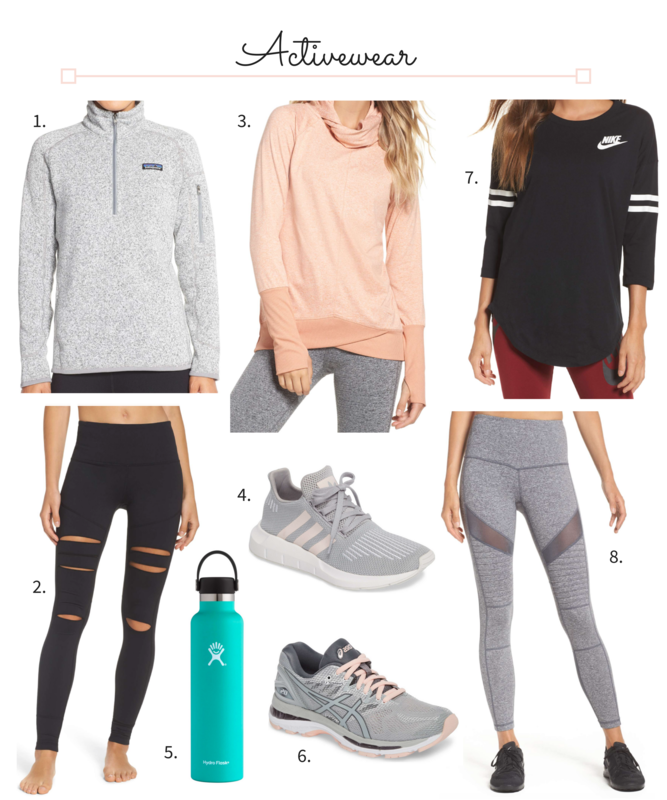 With so many people having fitness goals on their list of new years resolutions, it seems fitting to share some must-have activewear pieces with you. Personally, I know that wearing a cute workout outfit motivates me to push harder when I workout. I mentioned this in my workout motivation tips post last year. While there are so many amazing athletic brands out there, recently I’ve been loving Zella, Nike, Adidas, and Patagonia. I’m totally crushing on this Patagonia zip pullover and don’t get me started on this Nike top. Why are workout clothes so cute?! I know they are supposed to be for exercising, but I just love wearing them when I’m running errands and hanging at home. Of course, if you’re working out a ton, you need a good reusable water bottle that will keep your water cold. The best item for that is hands down a Hydroflask! I can put ice in mine and after 24 hours there is still ice in it and my water is still cold! As for running shoes, my preference is Asics! I currently own these ones (carbon/white/flash coral color), but I’m dying over the color palette of these new ones! I may just need to click “add to cart” on them! Also, if you want to see more fitness-related content on My Styled Life, please let me know. My goal is to always provide you with content that you actually want to read!